SoftPlanet makes it possible for everyone to get free LAME MP3 Encoder download directly from our servers. There is no registration needed for downloading. 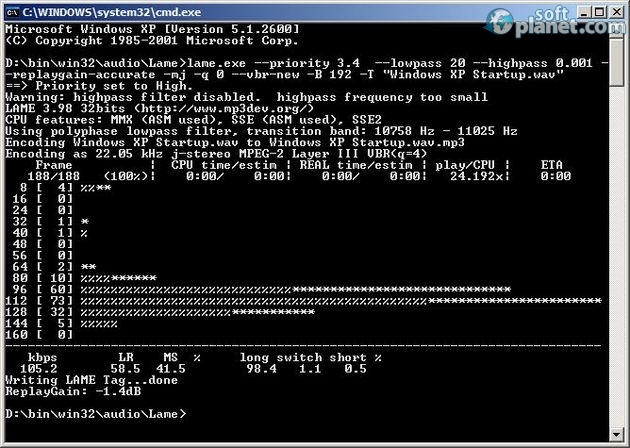 LAME MP3 Encoder 3.99.5 is a nice utility, which is mainly used for encoding audio to MP3 files. Thus they take less space on your hard drive. This app supports three different compression methods in order to achieve a smaller size. This software is absolutely free of charge so you don't need to pay anything in order to have it right away. The there compression methods that the app uses are CBR, VBR and ABR. The first one can be used if you want to keep a constant bitrate all over the audio file. The next method allows you to compress files keeping a user-defined quality level. The ABR one is a combination of both aforementioned methods. LAME MP3 Encoder 3.99.5 is a proper choice if you want to convert audio files to MP3 files in order to save space of your hard disk. Unlike some its rivals it supports there different encoding methods that you can choose among. LAME MP3 Encoder is VIRUS-FREE! Our security scan shows that LAME MP3 Encoder is clean from viruses. The current version of LAME MP3 Encoder has been scanned by our system, which contains 46 different anti-virus algorithms. That ensures that LAME MP3 Encoder 3.99.5 is 100% safe for your computer.